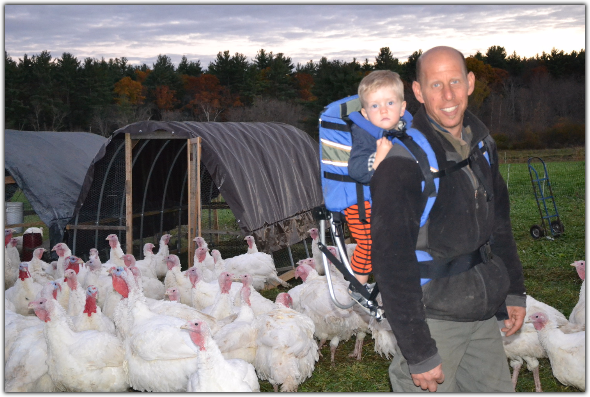 We have been growing tasty turkeys in small flocks since 2011. Pete is a big fan of turkey meat and since we believe our turkeys are the best birds to be found anywhere, we figure we might as well grow plenty extra so folks can enjoy them as mush as we do! The birds we raise are so amazing...because they eat greens! As with all our critters, we raise the turkeys outdoors on pasture during the peak of the pasture season. We tend to grow forage crops (think sweet pea tendrils!) to supplement the clovers and grasses. Over the years we have grown both heritage breeds and the more standard Broad Breasted Whites that many customers enjoy. read about our farm and tasty turkeys in the huffington post!